Long time readers know I’m a little hooked on baking for breakfast. I love it all but breads are one of my favorites as it works great for really any time of day and freezes well. 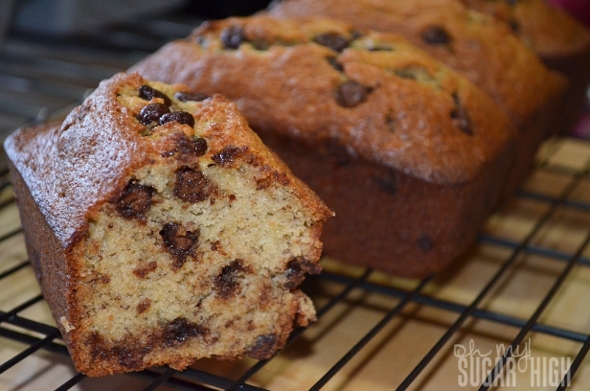 One of our very favorite muffins are banana chocolate chip so I thought it was about time I try it in bread form. I made a double batch which included one large loaf and four mini loaves and my family couldn’t get enough! If I hadn’t frozen two of the little loaves right away both batches would have been gone in two days. 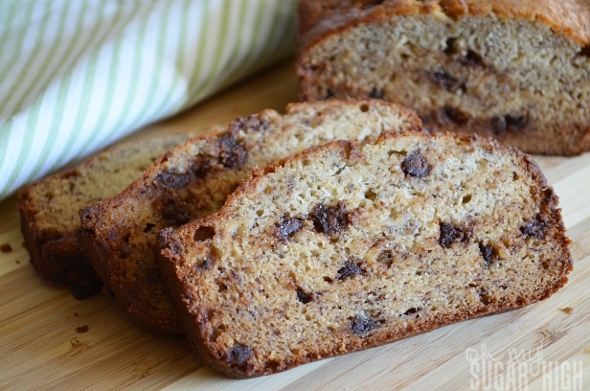 This recipe is moist, flavorful and I dare you to eat a single slice in one sitting! Cream sugar and butter in large mixing bowl. Beat in eggs and vanilla until thoroughly blended. Stir in bananas. In separate bowl, combine flour, baking soda, salt and cinnamon. Add to creamed mixture and stir just until combined. Fold in chocolate chips. Pour batter into greased 9-in.x 5-in. x 3-in. loaf pan or mini loaf pan. Bake at 350 degrees Fahrenheit for 60-70 minutes or a toothpick inserted in center of loaf comes out clean. (Reduce baking time to 35-45 minutes if using mini loaf pan.) Cool in pan for 10 minutes before transferring to a wire rack to cool completely. I have tried this recipe and it is amazing!!!! Very simple and quick!! I am in love! Thank you for a great recipe my family loved it, and will definitely be adding it to my collection of favourite recipes.